Want to be notified of new releases in jolexa/s3-staticsite-multiregion? On February 28th, AWS S3 in us-east-1 was down for several hours. Many people, myself included, host static sites (or files) on S3. Static sites backed by AWS S3 are great because they actually don't require servers to host a website (#serverless, :D). However, this outage event broke many SLAs for customers and was a general annoyance or even embarrassing. It is true that other regions were not affected too much but us-east-1 is the most popular region and probably the biggest. I don't want my personal sites to go down in this event. Companies don't want their assets to be unavailable, or down. Many people can benefit from a better solution here. In expected AWS fashion, they provide the tools (as seen here) but not the end-to-end solution. My goal is to provide a reference implementation of a multi-region s3 backed static site (or CDN). Your mileage may vary but it is a simple enough concept for me and does not require maintenance (or much extra cost) so I will be switching my own assets to this model until something better is available. If the S3 bucket it to serve files directly, the S3 bucket name must be the domain name itself (eg, static-site.jolexa.us). Since S3 has a global namespace, this means that you cannot have S3 bucket replication across regions with the same bucket name, it is simply not possible by design. So, if we take this to its conclusion, let's say we have static-site.jolexa.us bucket in us-east-1 which replicates to static-site-standby.jolexa.us bucket in us-west-2, and east goes down, we cannot point our domain record to the standby site, it will not work correctly. Note we could probably do something clever here with nginx or similar, but that would require a server and we don't want to rely on that, on principal. Route53 Health Checks and failover DNS? This won't work either, for similar reasons to the above. The S3 bucket must be named the domain name. Rumors are that, on the Feb 28 event, we couldn't even create/rename/update S3 in us-west-2 since the S3 metadata service in us-east-1 was not available (I didn't confirm this). A common pattern is to have CloudFront fronting an S3 bucket. This works but has another set of limitations. Mainly that you cannot have multiple CF distros which serve the same domain. So, what does this mean? It means, that there is no native way to have a multi-region static site hosted on S3. 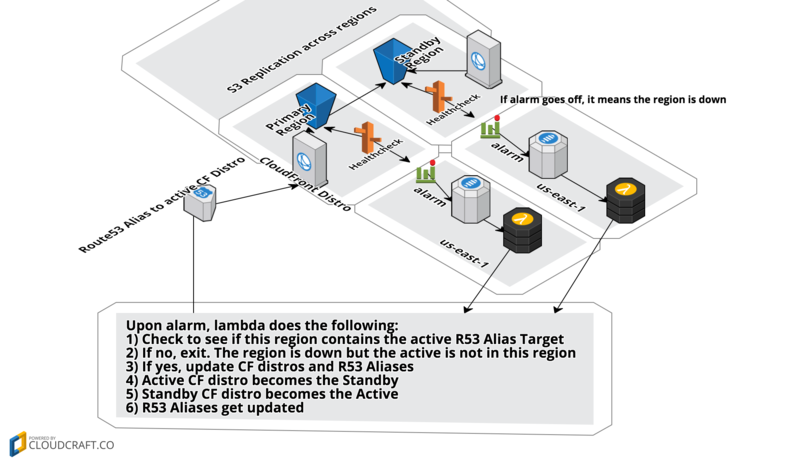 The Lambda Function is designed to be run by either CloudWatch alarm and does the proper action based on Environment Variables that are passed at deploy time. I choose to manage everything inside of CloudFormation because it represents the most manageable infrastructure available as well as the least possible way of interfering with existing infrastructure. SAM CloudFormation artifacts must be in the same region as the Lambda Function but Nested Stack template artifacts can be in any region. This surprised me but it is why there is a call out to us-east-1 bucket for artifacts. The amount of work (and documentation discovery!) to get some services communicating across regions is a high barrier to entry. ACM integration with CloudFront is a great thing, extremely easy to use and secure a site. I was experimenting with custom domains in API Gateway as well and since it uses CloudFront as a dependency, the ACM cert must be in us-east-1 despite the API being in any region. I was surprised by AWS' own dependency on us-east-1 and even though many services are multi-region, not all are and some mostly require us-east-1 themselves (not confirmed, but seems likely when you use a mix of services more). Maybe this is only the case with older/mature services? Using Lambda to update CloudFormation is possible but requires some trial and error to figure out what permissions are needed to update the stack. CloudFormation just calls APIs, such a great model. I knew this but it started to become very apparent with multiple stacks for a service. Nested stacks are elegant because you can update them out of band then have the parent stack update them back to a known state. Route53 Health Checks will report an endpoint unhealthy with 18% of health checkers report unhealthy. This is not configurable and may change in the future. Odd choice? Once something is deployed with cloudformation, be careful about updating it with boto3. I spent many cycles fixing out-of-sync resources that I could no longer manage. I want to know if it is faster to change a CloudFront CNAME or to switch the origin of a CloudFront Distribution. This is a pretty hard test though and it requires almost the same infrastructure. In practice, this architecture for a static site hosted on S3 will only incur a few extra costs over a directly backed site. CloudFront: Transfer is actually cheaper than S3 transfer to the internet. Requests are more expensive. Lambda: Fractions of pennies if they are even used. No cost otherwise. SNS: No Charge to the lambda invocation. Maybe a fraction of a penny if an email notice is sent. Health Check: No charge for checking AWS endpoint. ACM (SSL): Free - Really nice too, because the time burden of updating/rotating SSL certs is not applicable anymore. So extra cost savings in terms of your time. Most of these pennies will be within the perpetual free tier as well so the actual cost will vary depending on your account size. I have fabricated a test and the timings of breaking the site to a having a mostly working live site again is about 2 minutes. The really interesting thing is when you check the site from around the world during a failover. The only access I have to this is by using Amazon Health Checks again, this time checking the actual URL. From this, you can start learning about CloudFront latency and why it takes 15-60 minutes to update a CloudFront distro with CloudFormation, or in the console. I think this is interesting because the site quickly becomes live again per Health Check standards (18% reporting ok) but takes awhile from around the world. I'm sure this ~2 minute result can be tuned further with more frequent health check intervals and tighter timings. A colleague told me that "this whole thing looks complicated and what about cloudflare?" I use cloudflare on some other web properties and I agree, this is complicated! Cloudflare offers static asset caching as well if your origin is offline. The free plan will crawl your site every 3 days. The next level costs a magnitude more than the costs listed above. It is up for debate on if that is worth it or not. In the end, I feel like for it might be worth using Cloudflare over this complicated thing if you desire simplicity. There might be some other features that can easily check multiple origins from cloudflare with different plans. I will be more than happy to answer any questions on GitHub Issues and review Pull Requests to make this reference even better. Feel free to reach on on Twitter as well. Dan Farrell for peer reviewing this idea with me.